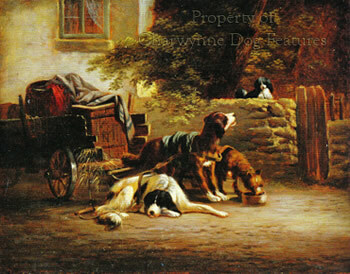 It is sad but inevitable that the most numerous type of dog in the Low Countries, Holland and Belgium, in the 18th and early 19th centuries, the workmanlike 'trekhonds' or draught dogs, are no longer with us. 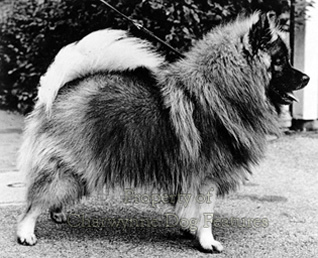 Belgium still has her barge dog, the Schipperke, and Holland her equivalent, the Keeshond or Wolfspitz, but their numbers are low. Holland has restored her terrier, the Smoushond, but that is unusual. Such is the passage of time and a commentary on how the employment of dogs once decided their numbers, unlike the fashion trends of today, not related in any way to employment. Commendably, one type of draught dog, the Belgian Matin, has been revived, mainly through one fancier's efforts. The shepherd dogs of these countries have survived but not through being working pastoral dogs but through the show ring. Thee words of Eric Halsall in his Sheepdogs – My Faithful Friends of 1980 tell a sad story of an ever-reducing need for the dogs of the pastures: “The Groenedael and its kindred spirits, the Malinois and Tervueren, I could not find in work on any Belgian farms, and the trials I found were those for police type work. The intelligent traits of the Groenendael have been utilized by the police for their requirements, and in many countries the breed has been evolved for the show bench. This is the fate of many West European working dogs. Only once in the Black Forest of Germany have I seen an Alsatian, the German Shepherd Dog, in action with a flock of sheep.” But this neglect is not new, rooted not in human whim, but created by an increasingly urban landscape and as the livestock market changes its nature. The herding breeds may have suffered less than the flock guardians but having lived in Central Europe on three different occasions, been based in Gibraltar for a year, as well as attending half a dozen World Dog Shows all over Europe, I am very aware of the decline in use of the pastoral breeds and their drift to the show bench – or oblivion. 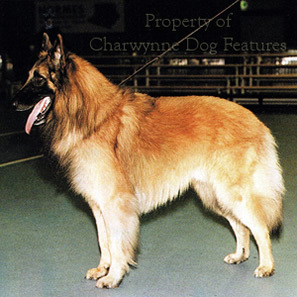 Centuries ago, the shepherd dogs of Belgium, Holland, France and Germany probably looked like one common breed, in a variety of coat textures and coat colours but otherwise indistinguishable. The four Belgian breeds and the two Dutch breeds may differ from today's one French , the Beauceron, and one German breed, but there were once distinct varieties of these, harlequins and rough-coated specimens for example. On a remote German farm, I once saw a merle shepherd dog; his owner was not surprised to get such a pup in his litter or the occasional black, white or rough-haired whelp too. We make so much more of breeds than our ancestors ever did. We favour some, to their detriment, and allow others, just as valuable, to lapse. In Britain, we could have still had four Welsh and four English breeds of pastoral dog. The herding breeds have been just as neglected abroad as in Britain. 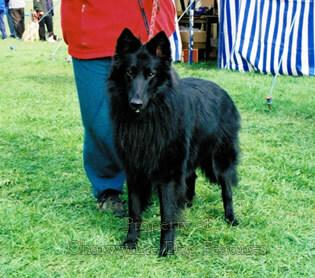 In Belgium, for example, their four varieties of shepherd dog, named after the region of their development: Tervueren, Groenendael, Malinois and Laekenois, were unrecognised and not bred to type until the invaluable work of Professor Reul of the Cureghem Veterinary School bore fruit at the end of the last century. 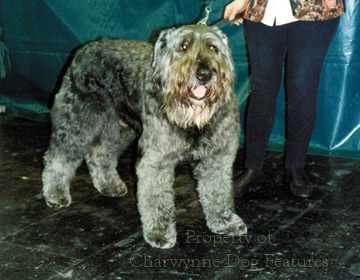 It is claimed I know by the FCI and some national kennel clubs that the Bouvier des Flandres (or drover's dog of Flanders) is Belgian but the breed developed when Flanders, a medieval principality spanning what is now Holland, France and Belgium, was French, although there was once Spanish influence there too. There can be a distinct resemblance between the Bouvier des Flandres, the rough-haired variety of the Dutch Shepherd Dog and the Laekenois especially when all three were working types. 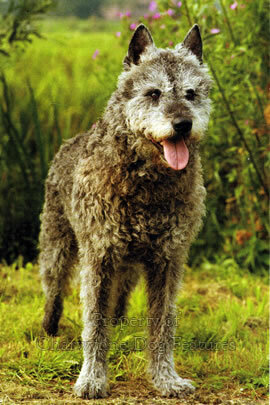 Similarly, location has led to the Bouvier des Ardennes, a breed reminiscent of the Pumi of Hungary, another Belgian drover's dog, showing signs of French pastoral breeds, although, again, we must remember that the old Ardennes region occupied what is now parts of Belgium, Luxemburg and northern France. Working dogs do not relate to modern national boundaries, much more to routes to markets and grazing rights. Breeds are a modern phenomenon. Few breeds of dog developed in isolation from their function. Against this background, the Bouvier des Flandres became associated with the agricultural plain of Flanders and enjoyed a wide variety of names: vuilbaard (dirty beard), koe hund (cow dog) and toucheur de boeufs (cattle-mover or drover). When cattle and sheep were transported to market and ports by rail and truck, concern was expressed for the dogs of the local drovers, rugged handsome dogs conforming to an identifiable type. In 1910 the Bouvier was first exhibited as four varieties, the Bouvier de Roulers for example being bigger and black, but in 1912 the growing band of enthusiasts combined forces to standardize these into one. Then the Great War played havoc with the breeding stock and it was left to a Belgian Army veterinary surgeon, Captain Darby, who by saving some good specimens founded the modern breed through his sire Ch Nic de Sottegem. 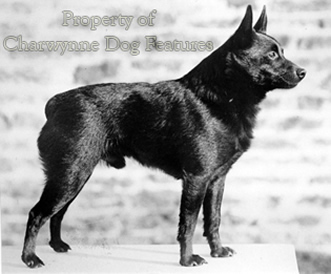 By 1922, the breed club had agreed the desired type and drafted a breed standard. Since then, the Bouvier has become more a personal guard-dog, police or army dog than a pastoral breed but has remained essentially a working dog. The first American standard was approved in 1959, and revised in 1975 following the sensible Franco-Belgian agreement. With the breed type now agreed internationally, the Bouvier is gaining in strength in many widely-separated countries on sheer merit. I am more than a little puzzled though why the colour chocolate-brown should be so disliked and severely punished in the breed; if an otherwise good pup emerges in this colour, why consign it to the bucket? In Holland however they do favour a rough-haired shepherd dog, with a short or smoother-haired and a long-haired variety too. 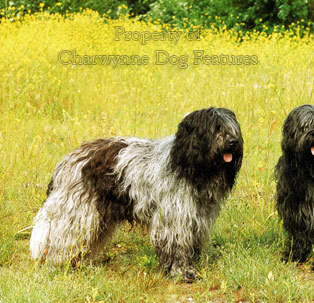 Not surprisingly, there is a matching content to the pastoral breeds of Holland to those of Belgium: a shepherd dog with a number of varieties, originating in location but manifested in coat texture, but with the addition of their Beardie, the Schapendoes, no surviving Bouvier but an all-round farm dog, the Smoushond, that may have had the same role as Ireland’s Kerry Blue and Wheaten Terriers – all-round farm dogs, especially around the yard itself. 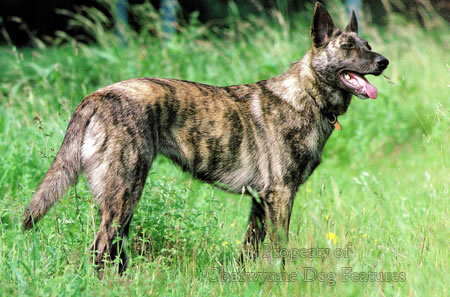 The Dutch Shepherd Dog is little known in Britain but has three attractive variations: short-, long- and rough-coated, with the last-named having a distinct look of the Belgian Laekenois in some specimens and a hint of Bouvier in the larger ones. The Schapendoes, under the harsh-haired herding type found, each only slightly different, in half a dozen European countries. The Dutch Beardie, the Schapendoes, comes from the northern province of Drenthe and was used to move large flocks of sheep and has the predictable type for such a breed: 45cms tall, 35lbs weight, with a long, wavy harsh-haired coat, usually in blue-grey to black but with all colours acceptable, although the distinctive blue-with-black seems to have become its breed-type. The breed was almost lost in the Second World War but fancier PMC Toepoel collected the remaining specimens together to restore the breed. 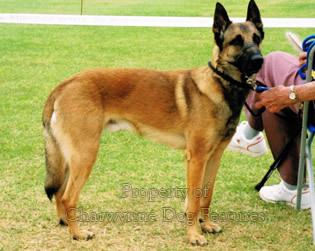 The FCI recognized the restored breed in 1989. In Germany, there was once a shaggy-coated smaller sheepdog, but, like the Hutespitz, the Schafpudel, or sheep-poodle, seems to have been lost. 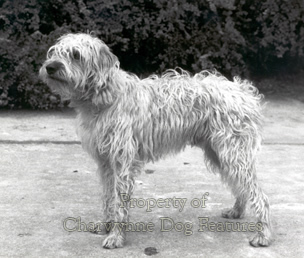 This type displayed the corded coat, hence the poodle tag, and may have been linked to the Hungarian Puli. In the hound breeds, the story of lost breeds continues. 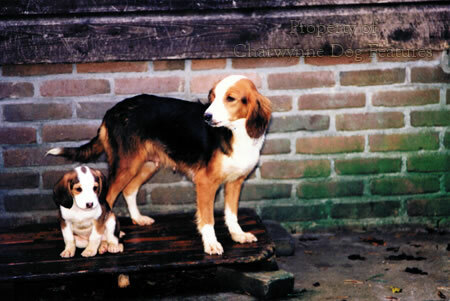 The Nederlandse Steenbrak or Oudhollands Steenbrakje (old Dutch small hound) is not yet fully recognised as a breed, but In many of the old German and Dutch hounds, the bone structure is lighter and flatter than most scenthound breeds, with the longer ears of the French hounds, but hanging flat not turned as in the Bloodhound. Steenbrakken, most unusually for a scenthound breed, can be long-haired as well as short-haired; both this breed and the Sauerland Hound have a characteristic flesh-coloured stripe up over the nose. This was I believe a feature too of the old Flemish hounds. In an increasingly urban Europe we have to be careful not to lose the ancient hound heritage in so many countries, although in the east, the rise of national spirit has awakened interest in their sporting canine legacy. The French have demonstrated how such a legacy can be reinvested, after the deprivations of two World Wars. 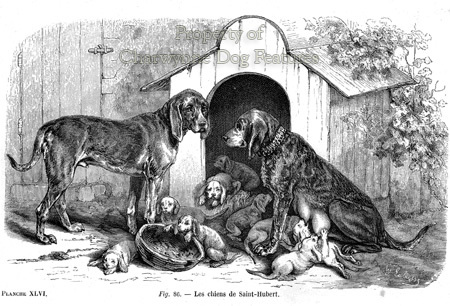 In its Illustrated Breed Standards the Kennel Club records: “The home country of the breed is Belgium and ancestry can be traced back to the monastery of St Hubert. In Belgium the Bloodhound is known by his other name of St Hubert Hound. It is most probable that this hound was one of those brought to England by the Normans in 1066.” Apart from the fact that Belgium did not become a country until 1830 and the hounds of the monastery were all-black, the great French hound expert of the nineteenth century, Count le Couteulx de Canteleu, held that all French hounds were descended from the St Hubert strain. The monastery is in the Ardennes, a region long famous for its schweisshunds but for black ones. The naming of the Bloodhound as the Chien de St Hubert, and the recognition of Belgium as its origin source, was done unilaterally by the FCI, the international kennel club based there. I think it is far more likely that the modern breed of Bloodhound was developed in Britain. The noun ‘bloodhound’ has been used loosely to describe hounds developed as far apart as Cuba and South Africa. The naming of breeds of dog has rarely been impressive. 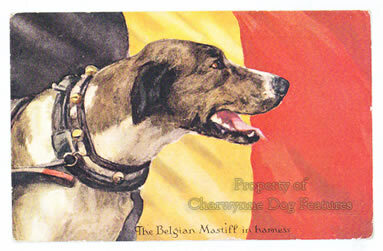 The Belgians are not famous for their native gundog breeds, but their Dutch neighbours are. Dutch gundogs, in many ways, reflect their country, a land with a long history of dealing with water. Whilst German gundogs are now well established in Britain and Italian, French and Hungarian breeds have made their mark too, the admirably workmanlike, more modest, relatively unsung gundog breeds from Holland are almost unknown here. This is despite the long association between sportsmen in our eastern counties and those of northern Holland. Friesland too is well known to cattle breeders but the gundogs from there are little known to potential users here. Water-dogs and decoy-dogs were undoubtedly traded between the Frisian Islands and East Anglia for centuries, influencing our now extinct red decoy dog and English Water Spaniel. The Dutch have retained their water dog and their decoy dog and shame on us for not doing likewise. The Kennel Club has recently recognised the American Water Spaniel but offer no incentives for a re-creation of our lost water spaniel, despite it once being recognised by them. If you asked the average British sportsman if he knew of the Stabyhoun, the Drentse Patrijshond, the Kooikerhondje and the Wetterhoun, you would probably get a blank stare. Their other names give clues as to their origins: Frisian Pointing Dog, Partridge Dog from Drenthe Province, Dutch Decoy Dog and Frisian Water Dog respectively. They are unspoiled breeds, unfashionable but unexaggerated - favoured mainly by true devotees of each breed, rather than fickle sportsmen or show fanciers, ever ready to move on to the next 'breed of the day'. Bred for robustness and performance, not show points or flashy coats, they are not breeds for show-offs or followers of the latest trend. Even when living on the Dutch/German border, I found it hard to get news of them. But a Dutch Decoy Dog has been working at the Boarstall Wild Duck Decoy at Brill near Aylesbury, under Jim Worgan. 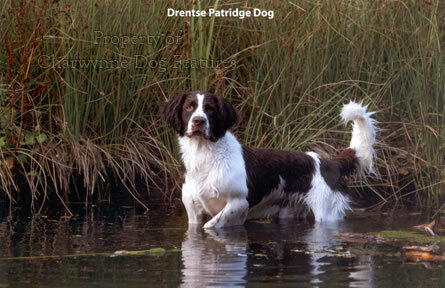 The Drentsche Partridge Dog is 55 to 63 cms high (about the size of a whiptail) and white with brown or orange patches, a most handsome gundog. A bigger dog is tolerated in the breed if the symmetry is there. It looks like a miniature English Setter or Small Munsterlander. It was developed to hunt the country of the small Dutch province whose name it bears, rough terrain with plenty of heather and tall grass, often fenced by dense wooded banks. The breed is prized for its calm temperament, strong desire for work and especially for its tracking ability in an area where game could be lost too easily. It is believed to have developed from the European group of gundogs known variously as the epagneul in France, the spaniel in Britain and the spanjoel or spioen in the Low Countries. It is a pointer-retriever in modern terms. 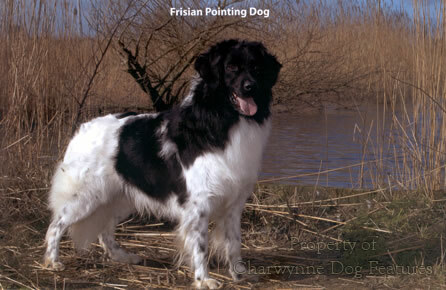 The Frisian Pointing Dog is a little smaller, at around 53 cms high (a shade bigger than our springer) and in appearance resembles a long-haired parti-coloured small setter. Also known as the Stabyhoun, they were often interbred with the Frisian Water Dog and used as mole-hunters and polecat eradicators. 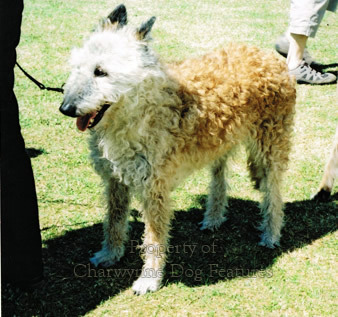 Some fanciers promoted the black-headed versions, as did some Munsterlander breeders, but the Water Dog influence, seen in the curly tail, is discouraged. A wavy coat is accepted but a curly one found objectionable by the current breed club. The depiction of these dogs in old Dutch paintings leads to their being identified by 'art experts' here as English Setters or Springers, much to the fury of patriotic more knowledgeable Dutch authorities. This is an attractive fussless breed, unspoiled by modern trends, such as exaggerated coats and over-angulated hindlegs. 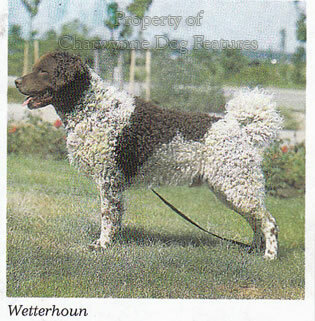 The Frisian Water Dog is of a type found all over Europe in past times, including Britain. Our English Water Spaniel, once listed by the Kennel Club, now lost to us, but easily restored if ever we regain our national pride, was in this mould. The Portuguese, the Spanish, the Italians, the French and the Americans have retained and treasured their water-dogs; we have, in our reckless pursuit of all things foreign, forsaken ours. The Frisian Water Dog, or Wetterhoun, is a curly-coated, solid black or brown or part-coloured two-foot high dog, rather like a smaller Curly-coated Retriever. As their name suggests they excel in water, and are robust working dogs, rather than ornamental pets. Over 40 Spanish, Portuguese and Italian Water Dogs are newly registered with our KC each year, over 120 pups; our Curly-coats average around 80 a year. 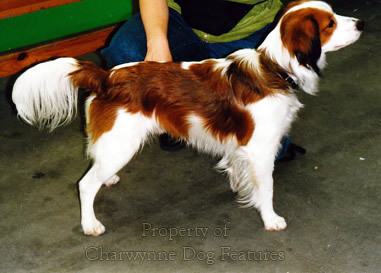 The Kooikerhondje or Dutch Decoy Dog is being used and shown here, and, with the Canadian breed, the Nova Scotia Duck Tolling Retriever, represents the only surviving decoy breeds in the world. We could so easily have retained our own Red Decoy Dog but were more intent on favouring overseas breeds, and, to be fair, improving them so that they became world-famous. Dutch sportsmen do of course use the superlative gundog breeds we have developed but have had the wit and national interest to preserve their own at the same time. Perhaps now we can promote our own native breeds of gundog, like the Curly-coated Retriever, the Field Spaniel and the Sussex. They are part of our sporting heritage and thoroughly merit our support. The Dutch have certainly shown us the way; as gene pools reveal more and more innate deficiencies, trapped as they are in the pursuit of breed purity, the blood of these Dutch gundog breeds may well have value in strengthening our stock too. The dogs of the Low Countries give us a wide variety of fine breeds across a wide field. The terrain has decided this range of types and we have been given, in the wider world, some quite splendid breeds to choose from. The pastoral dogs are rightly lauded but the gundog breeds under-rated. Their decoy dog was once of huge value in East Anglia, alongside our own version, now perpetuated in the Nova Scotia Duck-tolling Retriever. I do hope the two barge-dog breeds are retained, they are very much part of their countries' canine heritage. Older native breeds will always have distinct genetic value and should be treasured.